In an increasingly mobile workplace, providing secure, high-speed wireless connectivity to employees and guests is more important than ever. 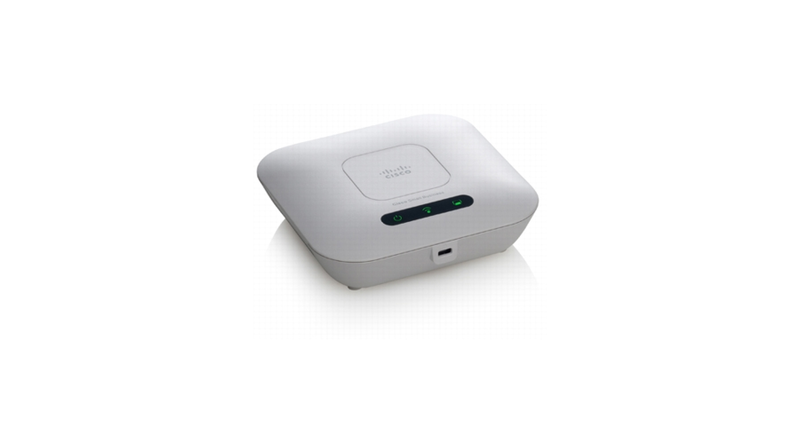 The Cisco WAP121 Wireless-N Access Point with PoE is an easy, affordable way to improve the performance and reach of your small business network with advanced 802.11n wireless technology. This flexible solution is ideal for connecting up to 10 employees and can scale to accommodate additional users and changing business needs. Designed for today's performance-intensive applications, the Cisco WAP121 employs 802.11n wireless technology to deliver high throughput and extended range throughout your office. It features built-in quality-ofservice (QoS) features that let you prioritize bandwidth-sensitive traffic, enabling the deployment of business quality voice over IP (VoIP) and video applications. The Cisco WAP121 is simple to set up and use, with intuitive wizard-based configuration to get you up and running in minutes. A sleek, compact design with flexible mounting options enables the access point to smoothly blend into any small business environment. Support for PoE makes the device easy to install without the need for separate power plugs or expensive new wiring. To enhance reliability and safeguard sensitive business information, the Cisco WAP121 supports both Wired Equivalent Privacy (WEP) and Wi-Fi Protected Access (WPA2), encoding all your wireless transmissions with powerful encryption. 802.1X RADIUS authentication helps keep unauthorized users out. For organizations that need to provide secure wireless access to employees, customers, and partners, it also provides support for separate virtual networks, with granular configuration options that let you provide the appropriate level of access for different users. With the Cisco WAP121, you can extend highly secure business-class wireless networking anywhere in the office, with the reliability and flexibility to meet changing business needs. Robust security, including WPA2, 802.1X with RADIUS secure authentication, and rogue access point detection, protects sensitive business information. Client bridge mode lets you expand your network by wirelessly connecting to a second Ethernet network. IntelligentQoS prioritizes network traffic to help keep critical network applications running at top performance.